The FRP fiber reflectance probe combines optical fibers at one end for sample measurement and is bundle bifurcated into two channels at the other end for connection to a light source and spectrometer. A fiber optic reflectance probe can measure either diffuse or specular reflectance from surfaces. When positioned at an angle to the surface normal, it measures diffuse reflectance. When positioned normal to the surface (0° angle of incidence) it measures specular reflectance. 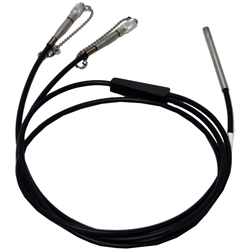 All standard FRP reflectance probes consist of a bundle of 7 optical fibers in a stainless steel ferrule (illustrated as Terminal C). Assemblies are available with UV or NIR grade fused silica optical fibers with standard fiber core diameters of 200μm. The light source and spectrometer channels feature standard SMA 905 connectors. The fiber configuration for these channels consists of two options. For use with B&W Tek’s CCD spectrometers that have a 200mm pixel height, a single fiber channel (Terminal B) serves as the spectrometer channel. A round bundle of six fibers serves as the light source channel. For all other B&W Tek spectrometers with larger pixel height, a linear bundle of six fibers is best used as the spectrometer channel, which will align to a spectrometer entrance slit.